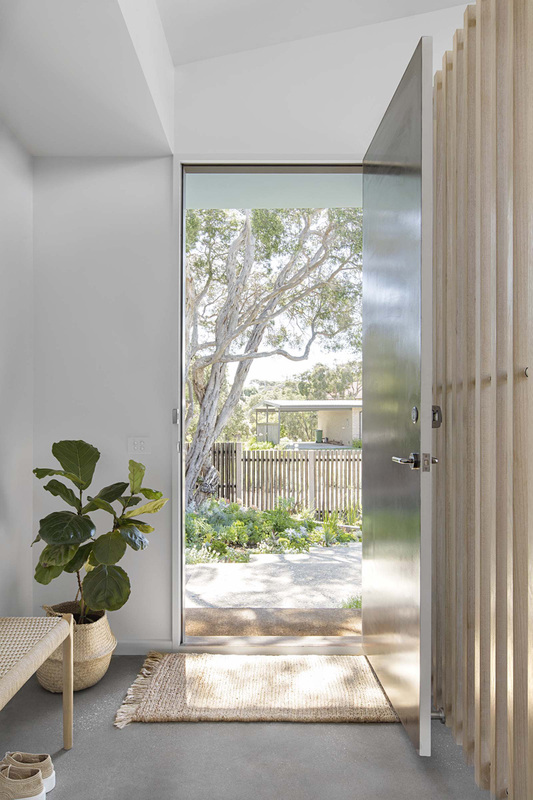 A steeply sloping, subdivided block near Sorrento’s Tideways Beach and pretty walking tracks offered the perfect blank slate for a new home with a beach house vibe and wildly eclectic, joyfully nostalgic garden. The client had a lifetime of home building experience and a clear vision for her latest venture, and knew as soon as she saw it that this was the site for her. The rest of the brief? Separate guest quarters with their own entrance for visiting family, skillion rooflines and lots of northern light, plentiful garden views – especially from the kitchen – a fully openable garage with storage, additional off-street parking for zipping in and out, while safely cordoned off from visiting grandkids or dogs, and a master bedroom towards the rear of the of the block that feels private but has a sense of openness to the rest of the house. But she had a strong garden design aesthetic of her own, a love of classic 1950s plants she grew up with, and a vast collection of cuttings and plants from friends and previous homes to incorporate into the mix, including figs, jonquils, capers and pots of succulents. Add to that her fondness for local indigenous species and all manner of hardy herbs and veggies and trailing fruits she shares with friends; it was clear from the start she’d handle selection, sourcing and planting herself. At Fiona’s suggestion the client engaged architect Clare Cousins, with whom the designer works regularly. 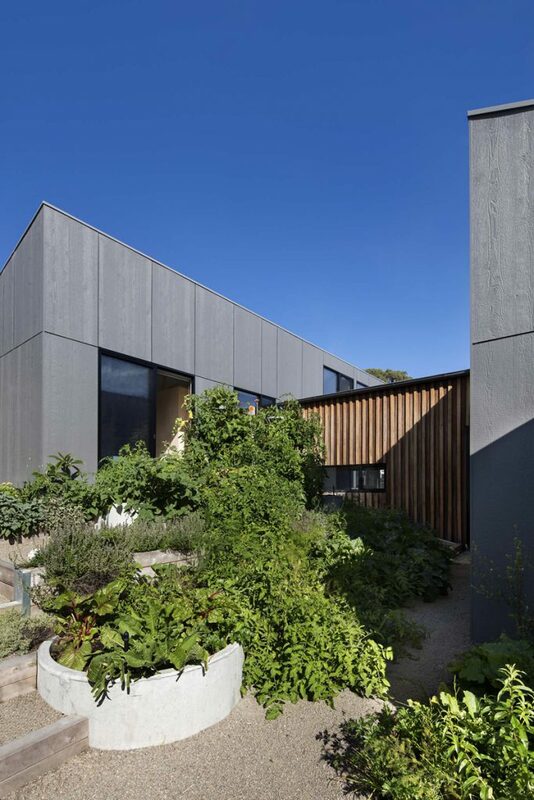 Clare and her associate Tara Ward responded with a clever design scheme that provides areas of privacy and openness by spreading programming across three pavilions linked by vibrant landscaped courtyard gardens and positioned according to the natural undulations of the site. “By breaking up the program into the three different pavilions it means that we didn’t need dramatic excavation cuts,” Tara says. 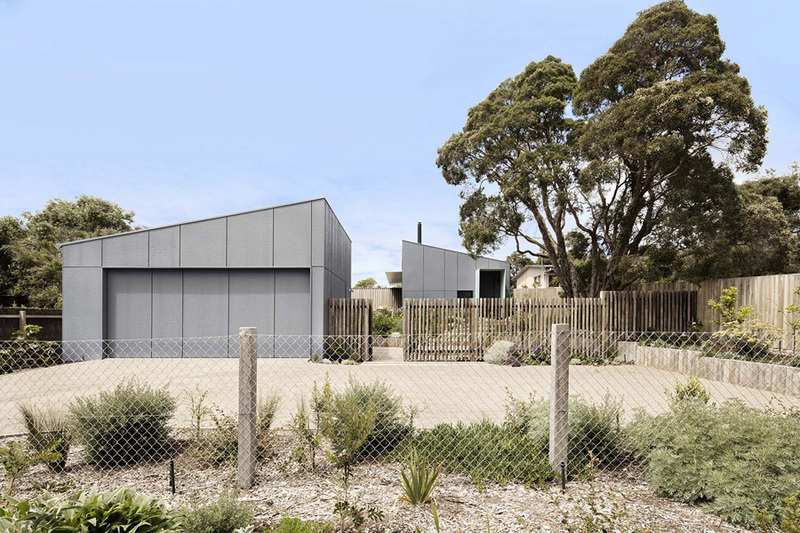 From the street, passersby can clearly “read” the gravel courtyard/off-street parking space running across the site at the front, as well as a handsome warm grey storage garage back slightly to the left. 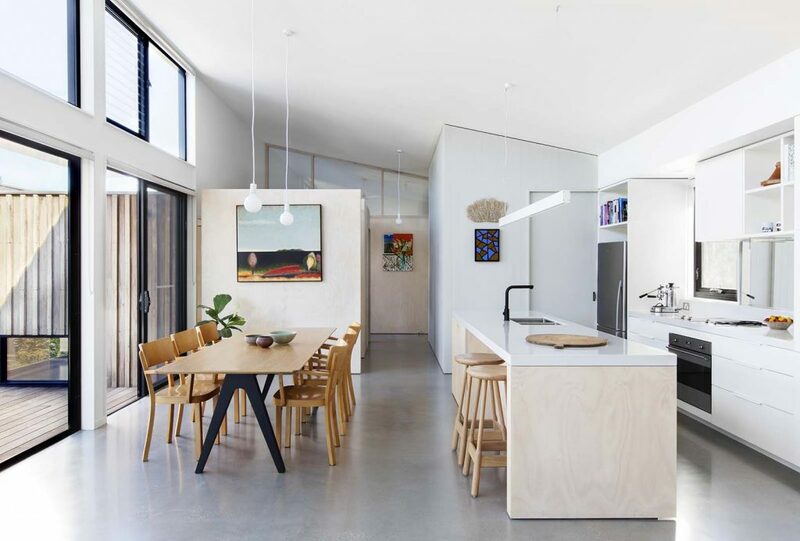 It has a skillion roof and generous doors at the front and rear, allowing it to open up completely for entertaining. But a timber fence running alongside it partially screens the rest of the property for privacy. Passersby see only tantalising glimpses through to a stepped front garden and the front entrance of a second pavilion containing the main house. 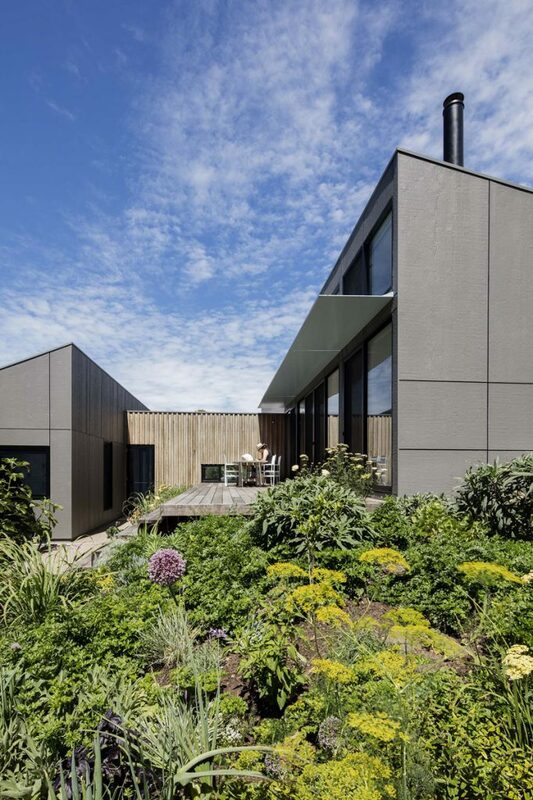 This is set well back towards the centre of the site and is ringed by already well established garden spaces and linked to a third pavilion housing guest quarters via an inscrutable breezeway at the rear and clad in battens of radially sawn silvertop ash. The guesthouse features two bedrooms and a bathroom, all with glorious views to a large, stepped productive garden at the rear and throughout the property. It is tucked away almost out of sight behind the garage. 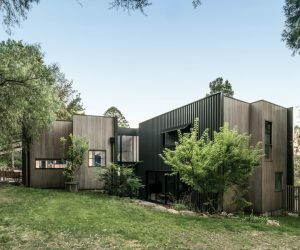 The three separate buildings are united outside by their skillion rooflines and warm grey cladding of low maintenance, cost-effective Weathertex, whose articulated sheets give a nod to the area’s classic fibro shacks. Internally they’re white “shells” warmed by timber joinery and screens, and wall cladding of limed hoop pine ply. 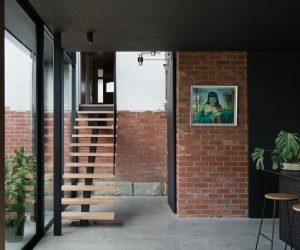 The house uses a site-sensitive strategy, which touches the land lightly and reduces the cost of excavation and ground works to create an affordable housing model. The positioning of the pavilions on site is oriented to the north. Extruded eaves welcome or exclude sunlight. 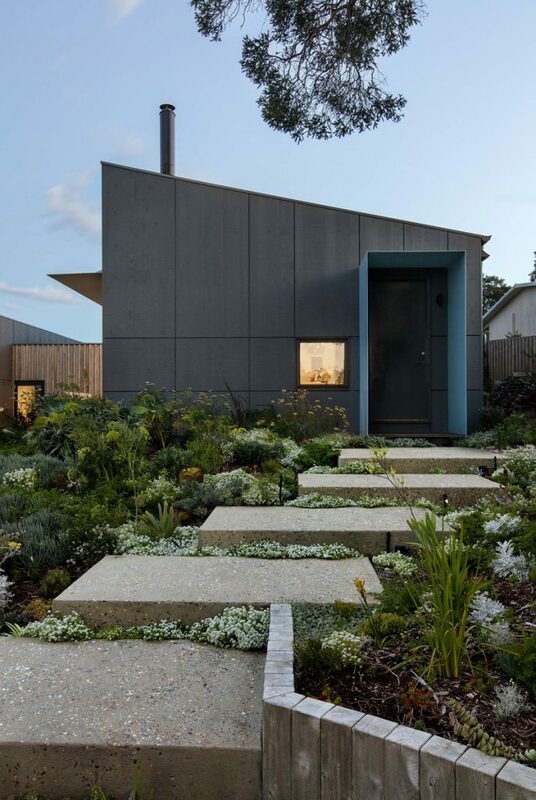 These measures optimise retention of passive heat through the concrete slab. Among the site’s premium integrated sustainable features are two 13000L water storage tanks, solar heated water, and tactically positioned double-glazed windows to effectively manage sun penetration. Ceiling fans work in tandem with high, operable windows to enable effective cross-ventilation throughout. Above all, Sorrento Beach House is designed as a flexible space able to be enjoyed by a variety of occupants – now and into the future. External cladding is Weathertex “Exterior board” in painted Woodsman Natural. External timber is unseasoned silvertop ash board and batten from Radial Timbers. Internal joinery is mostly Laminex laminate in Parchment natural finish. 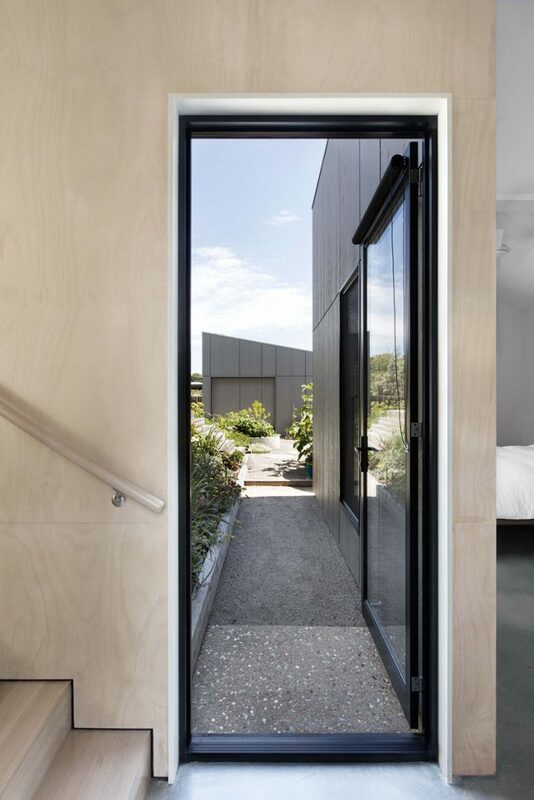 Internal wall cladding is BB Grade hoop pine plywood, limed and sealed with Loba Procolour Weiss. 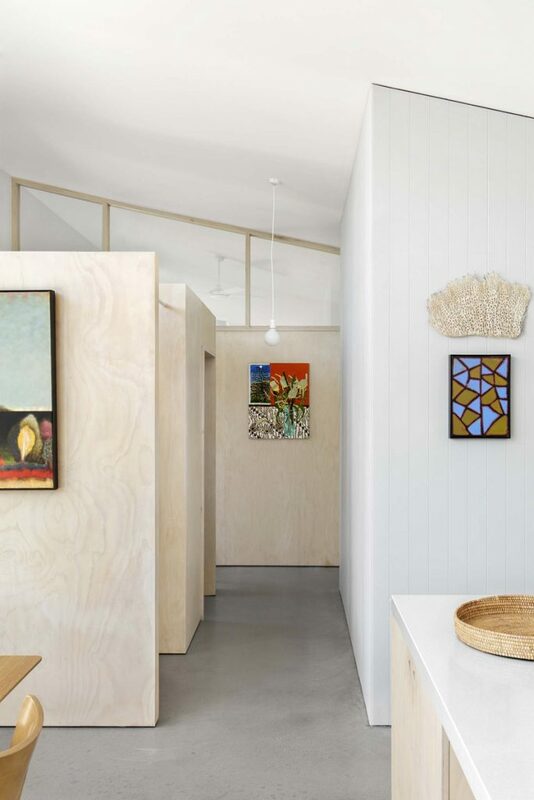 Internal wall cladding in the laundry pod is painted Ecoply Plygroove panelling from Gunnersens. 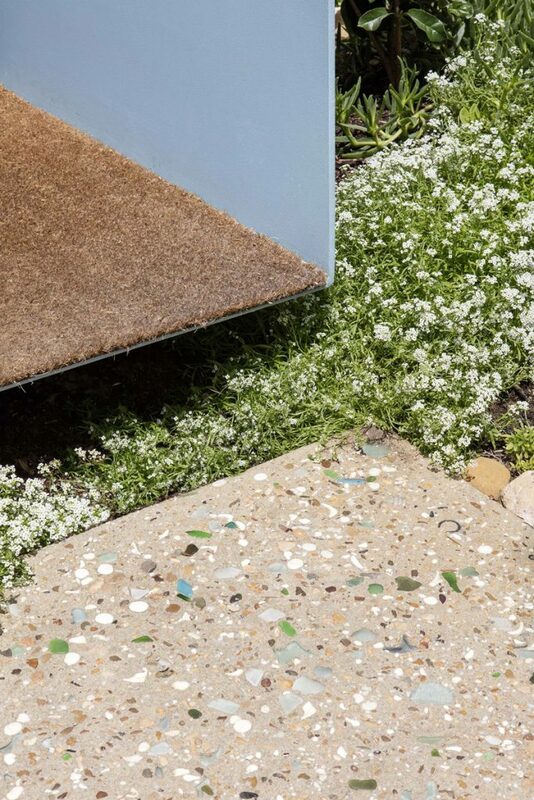 Flooring includes standard grey concrete slabs with white aggregate and light grind. 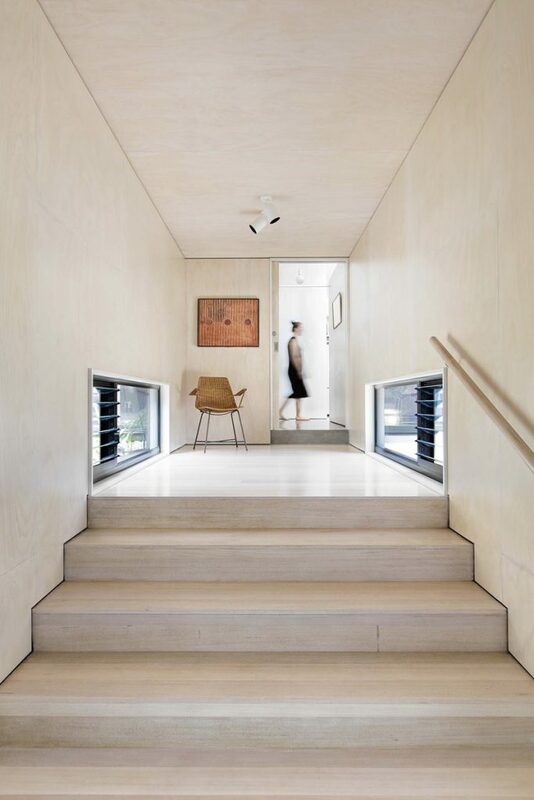 The breezeway uses Tasmanian oak boards limed and sealed with Loba Procolour Weiss. Floor tiles in the shower recess are Pale Blue Terrazzo tiles from Signorino. Under slab insulation is R1.0 rigid foam insulation. The new timber subfloor uses R2.0 subfloor insulation. New internal walls use Earthwool R2.0/75mm insulation. New external walls use Earthwool R2.5/90mm insulation and foil. Ceiling insulation in the main pavilion is Earthwool R6.0/275mm insulation and foil. The breezeway and guest pavilion use Earthwool R4.0/195mm Soundcontrol insulation and foil. 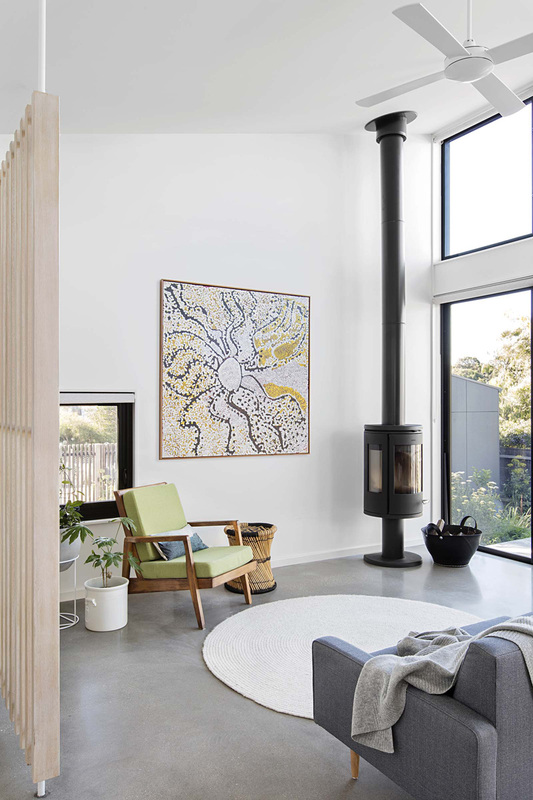 The house uses in-slab hydronic heating for the main pavilion, augmented by a Morso freestanding wood fire. There’s a reverse cycle split system for the living and master bedroom, and ceiling fans throughout. No electric clothes dryer is included in the laundry; instead a custom clothes line was built adjacent, taking advantage of the breezy coastal climate. Hot water is produced by an Endless Solar evacuated tube solar hot water service with gas boost. Toilets are flushed and the garden irrigated with rainwater stored in two 13000L, above-ground, corrugated Colorbond tanks from Kingspan Environmental. Each has a pump for automatic mains diversion. LEDs are used throughout. Most are surface mounted to avoid gaps in ceiling insulation. Spots are Comet GU10 LEDs from Masson for Light. Downlights are Minimal GU10 LED from Masson for Light. Suspended strip lighting over the island bench is from mLight.